Cosimo di Giovanni de' Medici (called 'the Elder' (Italian il Vecchio) and, posthumously, Father of the Nation' (Latin pater patriae); 10 April 1389 - 1 August 1464) was an Italian banker and politician, the first of the Medici political dynasty, de facto rulers of Florence during much of the Italian Renaissance. Despite his influence, his power was not absolute; Florence's legislative councils at times resisted his proposals, something which would not have been tolerated by the Visconti of Milan, for instance; throughout his life he was always primus inter pares, or first among equals. His power derived from his great wealth as a banker, and he was a great patron of learning, the arts and architecture. 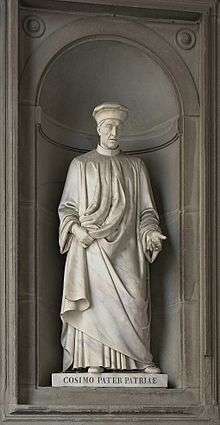 Cosimo de' Medici was born in Florence to Giovanni di Bicci de' Medici and his wife Piccarda de' Bueri on 10 April 1389. At the time it was customary to indicate the name of one's father in one's name for the purposes of identification between two like-named individuals; thus Giovanni was the son of Bicci, and Cosimo's name was properly Cosimo di Giovanni de' Medici. He had a twin brother, Damiano, who died shortly after birth. The twins were named after the Saints Cosmas and Damian, whose feast day was then celebrated on 27 September; Cosimo would later celebrate his own birthday on that day, rather than on the actual date of his birth. Cosimo also had a brother, Lorenzo the Elder, who was some six years his junior and participated in the family's banking enterprise. 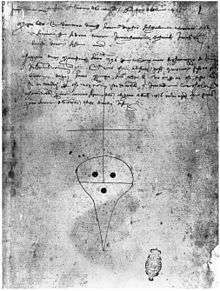 The late medieval mark of the Medici Bank (Banco Medici), used for the authentication of documents. Florenz, Biblioteca Nazionale Centrale, Ms. Panciatichi 71, fol. 1r. Cosimo inherited both his wealth and his expertise in banking from his father. Giovanni had gone from being a moneylender to joining his the bank of his relative, Vieri di Cambio, before opening up his own bank, Medici Bank, around 1397. He had been independently running Vieri's branch in Rome since the dissolution of the latter's bank into three separate and independent entities, but it was in 1397 that he left Rome to return to his home of Florence. Over the next two decades, the Medici Bank opened branches in Rome, Geneva, Venice, and temporarily in Naples; the majority of profits was derived from Rome. The branch manager in Rome was a papal depositario generale, managing Church finances in return for a commission. Cosimo would later expand the bank throughout western Europe, having offices also in London, Pisa, Avignon, Bruges, Milan, and Lübeck, which rendered it the best bank for the business of the papacy; bishoprics would be able to pay their fees into the nearest branch whose manager would then issue a papal license, and the popes could more easily order a variety of wares - such as spices, textiles, and relics - through the bankers' wholesale trade. In fifteen years he would make a profit of 290,791 florins. In 1415, Cosimo allegedly accompanied the Antipope John XXIII at the Council of Constance, and in the same year he was named "Priore of the Republic". Later he acted frequently as ambassador, showing a prudence for which he became renowned. 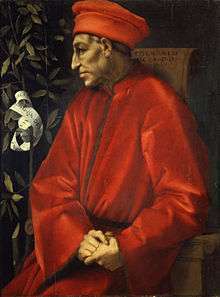 In 1410, Giovanni had lent John XXIII, then simply known as called Baldassare Cossa, the money to buy himself into the office of cardinal, which he repaid by making the Medici Bank head of all Papal finances. This gave the Medici family tremendous power, allowing them to threaten defaulting debtors with excommunication, for instance. Misfortune hit the Medici Bank this year when the Council of Constance unseated John XXIII, thus taking away the near monopoly they had held on the finances of the Curia; thereafter the Medici Bank had to compete with other banks. However, after the Spini Bank went insolvent in 1420, they again secured priority. John XXIII, facing the enmity of the council where he had been accused of, among other things, being a pagan, a liar, an oppressor, a thief, lecher, simoniac, and a traitor, was confined by Sigismund, Holy Roman Emperor to Heidelberg Castle until the Medici paid his ransom and gave him asylum. Giovanni withdrew from the bank in 1420, leaving its leadership to both of his sons. He left them 179,221 florins upon his death in 1429. Two-thirds of this came from the business in Rome, while only a tenth came from Florence; even Venice offered better business than Florence. The brothers would earn two-thirds of the profits from the bank, with the other third going to a partner. Besides the bank, the family owned much land in the area surrounding Florence, including Mugello, the place from which the family originally came. In 1433 Cosimo's power over Florence, which he exerted without occupying public office, began to look like a menace to the anti-Medici party, led by figures such as Palla Strozzi and the Albizzi family, headed by Rinaldo degli Albizzi: in September of that year he was imprisoned in the Palazzo Vecchio, accused for the failure of the conquest of Lucca, but he managed to turn the jail term into one of exile despite the fact that some, such as Filelfo, demanded his execution, a fate which may have been almost certain without the influence of the monk Ambrogio Traversari. He went to Padua and then to Venice, taking his bank along with him and finding friends and sympathizers wherever he went, especially because of his willingness to accept exile rather than resume the bloody conflicts which had afflicted the streets of Florence from time to time. Venice sent an envoy to Florence on his behalf, requested they rescind the order of banishment. When they refused, Cosimo settled down in Venice, his brother Lorenzo accompanying him. However, prompted by his influence and his money, others followed him, such as the architect Michelozzo, whom Cosimo commissioned to design a library as a gift to the Venetian people; within a year, the flight of capital from Florence was so great that the decree of exile had to be lifted. Cosimo returned a year later in 1434, to greatly influence the government of Florence (especially through the Pitti and Soderini families) and to lead by example for the last 30 years of his life of 75 years. Cosimo's time in exile instilled in him the need to squash the factionalism that resulted in his exile in the first place. In order to do this, Cosimo, with the help of favorable priors in the Signoria, instigated a series of constitutional changes to secure his power through influence. Following the death of Filippo Maria Visconti, who had ruled the Duchy of Milan from 1412 until his death in 1447, Cosimo sent Francesco I Sforza to establish himself in Milan to prevent the impending advance of the Republic of Venice. Francesco Sforza was a condottiere, a mercenary soldier who had stolen land from the papacy and proclaimed himself its lord; he had yearned to establish himself at Milan, as well, an ambition which was aided by the fact that the current Visconti head lacked legitimate children save for a daughter, Bianca, whom Sforza ultimately married in November 1441, after a failed attempt at winning her hand from her father. 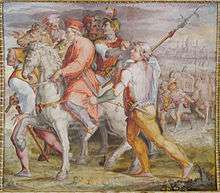 The resultant balance of power with Milan and Florence on the one side and Venice and the Kingdom of Naples on the other created nearly half a century of peace and allowed the development of the Renaissance in Italy. However, despite the benefits to Florence from keeping Venice at bay, the act was an unpopular one for Cosimo among his fellow citizens, primarily because they were called upon to finance the Sforza succession. The Milanese made a brief attempt at democracy before Sforza finally was acclaimed duke by the city in February 1450. A posthumous portrait of Contessina de' Bardi, Cosimo's wife, attributed to Cristofano dell'Altissimo, 16th century. In terms of foreign policy, Cosimo worked to create peace in Northern Italy through the creation of a balance of power between Florence, Naples, Venice and Milan during the wars in Lombardy, and discouraging outside powers (notably the French and the Holy Roman Empire) from interfering. In 1439 he was also instrumental in convincing pope Eugene IV to move the Ecumenical council of Ferrara to Florence. The arrival of notable Byzantine figures from the Empire in the East, including Emperor John VIII Palaiologos himself, started the boom of Greek culture and arts in the city. The floor tomb of Cosimo de' Medici in San Lorenzo, Florence. 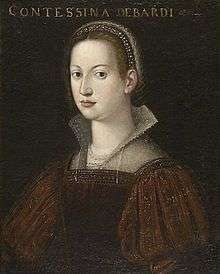 About 1415, Cosimo married Contessina de' Bardi (the daughter of Giovanni, count of Vernio, and Camilla Pannocchieschi). The wedding was arranged by his father as an effort to reaffirm relations with the long-standing noble Bardi family, who had operated one of the richest banks in Europe until its spectacular collapse in 1345; they nevertheless remained highly influential in the financial sphere. 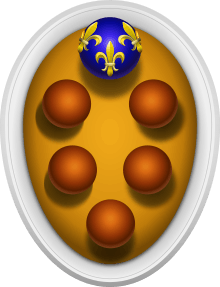 Only part of the Bardi family were involved in this marriage alliance, for some of the branches considered themselves the opponents of the Medici clan. The couple had two sons: Piero the Gouty and Giovanni de' Medici. Cosimo also had an illegitimate son, Carlo, by a Circassian slave, who would go on to become a prelate. On his death in 1464 at Careggi, Cosimo was succeeded by his son Piero "the Gouty", father of Lorenzo the Magnificent or Il Magnifico. After his death the Signoria awarded him the title Pater Patriae, "Father of the Country", an honor once awarded to Cicero, and had it carved upon his tomb in the Church of San Lorenzo. Cosimo de' Medici used his vast fortune to control the Florentine political system and sponsor a series of artistic accomplishments. 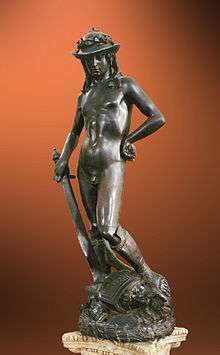 Donatello's "David", a Medici commission. Cosimo was also noted for his patronage of culture and the arts during the Renaissance, liberally spending the family fortune (which his astute business sense considerably increased) to enrich Florence. According to Salviati's Zibaldone, Cosimo stated: "All those things have given me the greatest satisfaction and contentment because they are not only for the honor of God but are likewise for my own remembrance. For fifty years, I have done nothing else but earn money and spend money; and it became clear that spending money gives me greater pleasure than earning it." Additionally, his patronage of the arts both recognized and proclaimed the humanistic responsibility of the civic duty that came with wealth. Cosimo hired the young Michelozzo Michelozzi to create what is today perhaps the prototypical Florentine palazzo, the austere and magnificent Palazzo Medici. The building still includes, as its only 15th-century interior that is largely intact, the Magi Chapel frescoed by Benozzo Gozzoli, completed in 1461 with portraits of members of the Medici family parading through Tuscany in the guise of the Three Wise Men. He was a patron and confidante of Fra Angelico, Fra Filippo Lippi, and Donatello, whose famed David and Judith Slaying Holofernes were Medici commissions. Cosimo's patronage enabled the eccentric and bankrupt architect Brunelleschi to complete the dome of Santa Maria del Fiore (the "Duomo") which was perhaps his crowning achievement as sponsor. In 1444, Cosimo de' Medici also founded the first public library in Florence, at San Marco. It was of central importance to the humanist movement in Florence during the Renaissance. It was designed by Michelozzo, a student of Ghiberti who later collaborated with Donatello and was also a good friend and patron to Cosimo. Cosimo contributed the funds necessary to repair the library and provide it with a book collection, which people were allowed to use at no charge. "That Cosimo de'Medici was able to finance the construction of such a site placed him in a privileged position of leadership in the city. He hand-selected those individuals who were given access to this laboratory of learning, and, through this social dynamic, he actively shaped the politics of the Republic." He also commissioned Michelangelo to design a library for his grandson, Lorenzo de' Medici. His first library, however, was designed by Michelozzo while the two were in Venice, where Cosimo had been temporarily exiled. In 1433, in gratitude for the hospitality of that city, he left it a gift of a new library, his only such work outside Florence. His libraries were noted for their Renaissance style of architecture and important artwork. Cosimo had grown up with only three books, but by the time he was thirty his collection had grown to 70 volumes. After being introduced to humanism by a group of humanists who had asked for his help in preserving books, he grew to love the movement and gladly sponsored the effort to renew Greek and Roman civilization through literature. The humanists also engendered in him an interest in the collecting of books. "Heartened by the romantic wanderlust of a true bibliophile, the austere banker even embarked on several journeys in the hunt for books, while guaranteeing just about any undertaking that involved books. He financed trips to nearly every European town as well as to Syria, Egypt, and Greece organized by Poggio Bracciolini, his chief book scout." He engaged 45 copyists under the bookseller Vespasiano da Bisticci to transcribe manuscripts, and paid off the debts of Niccolò de' Niccoli after his death in exchange for control over his collection of some 800 manuscripts valued at around 6,000 florins. In the realm of philosophy, Cosimo, influenced by the lectures of Gemistus Plethon, supported Marsilio Ficino and his attempts at reviving Neo-Platonism. Cosimo commissioned Ficino's Latin translation of the complete works of Plato (the first ever complete translation) and collected a vast library which he shared with intellectuals such as Niccolò de' Niccoli and Leonardo Bruni. He also established a Platonic Academy in Florence in 1445 for the study of Plato. He provided his grandson, Lorenzo il Magnifico, with an education in the studia humanitatis. Cosimo had an inestimable influence on Renaissance intellectual life, diminishing the influence of Scholasticism with his financing of the reintroduction of the Greek classics. ↑ Martines, Lauro (2011). The Social World of the Florentine Humanists, 1390-1460. University of Toronto Press. p. 3. 1 2 Martines, Lauro (2011). The Social World of the Florentine Humanists, 1390-1460. University of Toronto Press. p. 8. ↑ Strathern, Paul (2005). The Medici: Godfathers of the Renaissance. London: Pimlico. pp. 45–126. ISBN 9781844130986. 1 2 George Holmes: How the Medici became the Pope’s Bankers. In: Nicolai Rubinstein (Ed. ): Florentine Studies. Politics and Society in Renaissance Florence, London 1968, pp. 357–380; Raymond de Roover: The Rise and Decline of the Medici Bank 1397–1494, Cambridge (Massachusetts)/London 1963, p. 46 f., 198, 203; Volker Reinhardt: Die Medici, 4., revised edition, Munich 2007, S. 21; John R. Hale: Die Medici und Florenz, Stuttgart 1979, p. 13; Alison Williams Lewin: Negotiating Survival, Madison 2003, p. 210 f.
1 2 Setton, Kenneth M. [ed.] (1970). The Renaissance: Maker of Modern Man. National Geographic Society. p. 46. 1 2 Hallam, Elizabeth (1988). The War of the Roses. New York: Weidenfeld & Nicolson. p. 111. ↑ Hallam, Elizabeth (Ed.) (1988). The Wars of the Roses. New York: Weidenfeld & Nicolson. p. 110. ↑ Durant, Will (1953). The Renaissance. The Story of Civilization. 5. New York: Simon and Schuster. p. 366. ↑ Quoted by C.Hibbert in The Rise and Fall of the House of Medici, 1974 in Martin Longman, Italian Renaissance (Longman, 1992). ↑ Durant, Will (1953). The Renaissance. The Story of Civilization. 5. New York: New York. p. 193. ↑ Williams, Henry Smith (1905). The History of Italy. The Historians' History of the World. 9. New York: The Outlook Company. p. 352. ↑ Schevill, Ferdinand (1963). Medieval and Renaissance Florence. 2. New York: Harper & Row, Publishers. p. 360. ↑ Durant, Will (1953). The Renaissance. The Story of Civilization. 5. New York: Simon and Schuster. p. 76. ↑ Schevill, Ferdinand (1963). Medieval and Renaissance Florence. 2. New York: Harper & Row, Publishers. p. 361. ↑ Tomas 2003, p. 16. ↑ Volker Reinhardt: Die Medici, 4., revised edition, Munich 2007, p. 20 f.; Dale Kent: The Rise of the Medici, Oxford 1978, p. 40 f., 49–61. ↑ Tomas 2003, p. 7. 1 2 Meehan, William F. (2007). "The Importance of Cosimo de Medici in Library History". Indiana Libraries Vol. 26 Number 3.